We hate that feeling of waking up in the morning, unsure of what to wear. Each Sunday night, we’ll post seven looks to serve as style inspiration for the upcoming week. We’ll pull our favorite looks from the many awesome personal style blogs and fashion news coverage. What will you wear this week? This week’s style inspiration comes from Blair Eadie of the fashion blog, Atlantic-Pacific. Make a statement today. You might wear a sleeveless sweater with collared shirt tucked into a bright and colorful full skirt. Try some shoe clips to add an artistic sensibility to your standard black pumps or sandals. Love the idea of this untucked white button-up that’s belted with a blazer over top. Layer a striped shirt under a jumper. Wear with stilettos and a colorful handbag. Wear a cargo jacket over a maxi dress. Get some extra height in heels. With a look this loose and unstructured, add some polish with a structured clutch. Go casual chic with some lightly distressed denim, an embroidered peasant blouse, electric blue sandals and some Jackie O shades. Pair a graphic tee with a full mini skirt. Use a carryall bag if you’ll be out all day or just carry your wallet on your trip to the movies. 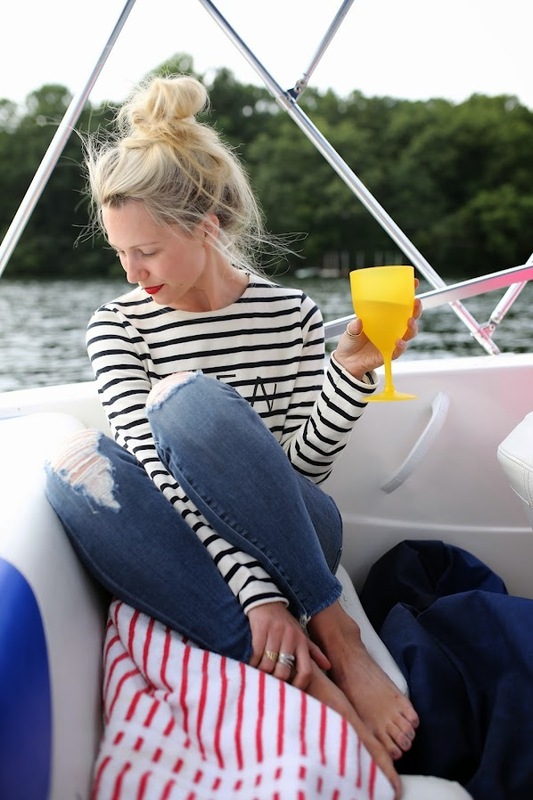 Relax on a boat (or at a table at your favorite BYOB brunch spot) in well-fitted jeans and a striped top. Carry your vino in a wine tote. Link below to your favorite style inspiration post from Blair’s blog, Atlantic-Pacific!